Induction motors are most widely using motors in present days for domestic and industrial purpose.But controlling of AC motor is little bit difficult than DC motor due to alternating nature of voltage.Speed control of induction motors is difficult than dc motors.That’s why induction motor use was restricted.But efficiency wise,usage wise induction motors has lots of advantages.So some speed control,braking methods of induction motor are invented. Braking is the most important part of speed control.Braking is two types.They are,mechanical and electrical.In mechanical braking we have disadvantages like heat dissipation,mechanical brakes also depends on the skill of the operator.Electric braking is easy and reliable,it can stop the induction motors very quickly.So we go for electrical braking on induction motor.Though the motor is brought to rest electrically, to maintain its state of rest a mechanical brake is must. 1. Two lead connections : In this method, the line disconnected, kept open. 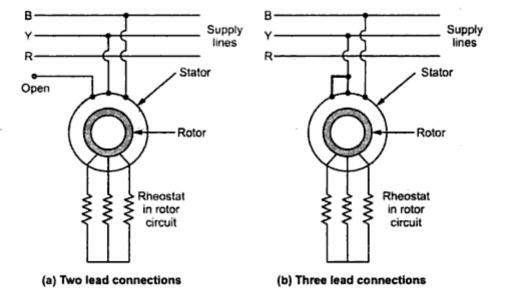 This is shown in the Fig(a) and is called two lead connections of rheostatic braking. 2. Three lead connections : In this method, After disconnection of the line,it is connected directly to the other line of the machine. This is shown in the Fig(b). Note : This method is effective only for slip ring or wound rotor induction motors. As one of the motor terminal is disconnected from the supply, the motor continues to run as single phase motor. In this case the, breakdown torque i.e. maximum toque decreases to 40% of its original value and motor develops no starting torque at all. And due to high rotor resistance, the net torque produced becomes negative and the braking operation is obtained. Which is preferred in rheostat braking on induction motor? The braking torque is small in the case of two lead connections,high in the case of three lead connections.The braking torque is high at high speeds. But in three lead connections there is possibility of inequality between the contact resistances in connections of two paralleled lines. This might reduce the braking torque and even may produce the motoring torque again.So we prefer two lead connection over three lead connection.Even there is low braking torque in two lead system. Uses: We use dynamic or rheostat braking in cranes. 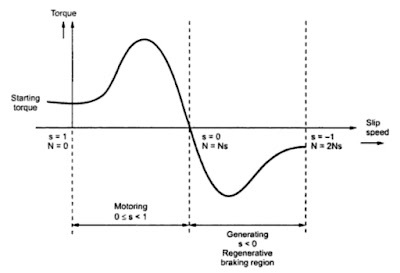 Plugging induction motor braking is applied by just reversing the supply phase sequence.by interchanging connections of any two phases of stator we can attain plugging braking of induction motor.Due to the reversal of phase sequence, the direction of rotating magnetic field gets reversed. This produces a torque in the reverse direction and the motor tries to rotate in opposite direction. This opposite flux acts as brake and it slows down the motor.During plugging the slip is (2 - s), if the original slip of the running motor is s.
1. During the plugging operation very high I²R losses occur in the form of heat.This heat is more than produced when rotor is normally locked. 2. So we can't apply plugging frequently as due to high heat produced rotor which can damage or melt the rotor bars and even may over heat the stator as well. 1. It the quickest way. 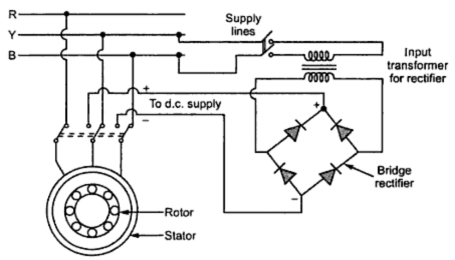 This is also similar to dynamic braking of induction motor,two connections of stator are disconnected from the supply and connected to a dc source.When d.c. is supplied to the stator, stationary poles N, S are produced in stator. As rotor is rotating, rotor cuts the flux produced by the stationary poles. Thus the a.c. voltage gets induced in the rotor. This voltage produces an a.c. current in the rotor. The motor works as a generator and the R losses are dissipated at the expenditure of kinetic energy stored in the rotating parts. Thus D.C dynamic braking is achieved. 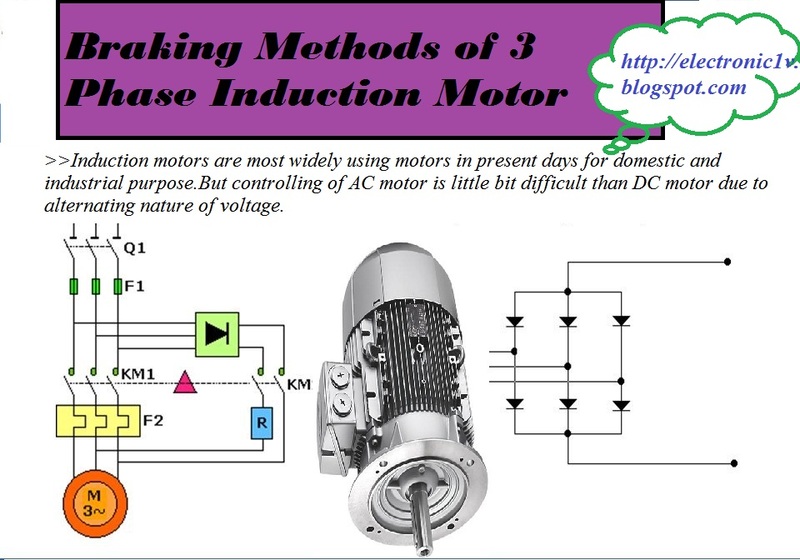 This is the quick way to stop induction motor along with high load. 1. Quick,Less heat produced as compared to the plugging method. 2. The energy dissipated in the rotor is not dependent on the magnitude of the d.c. current. 3. The braking torque is proportional to the square of the d.c. current. 4. Can be used for wound rotor,squirrel cage rotor induction motors. The input power to a three phase induction motor is given by, Pin = 3 Vph Iph cos Φ Where, Φ is the phase angle between stator phase voltage Vph and the stator phase current Iph.In motoring action This Φ is less than 90° for the motoring action.Φ > 90° for generating action. When the induction motor runs above the synchronous speed, relative speed between the conductors and air gap rotating field reverses, as a result the phase angle because greater than 90° rotor produces torque in opposite direction to achieve the braking thus regenerative braking takes place. Regenerative braking of induction motor can be applied only in case of constant frequency and speed must be above the synchronous speed.In generating action we get some power,we can use this to run other machine. 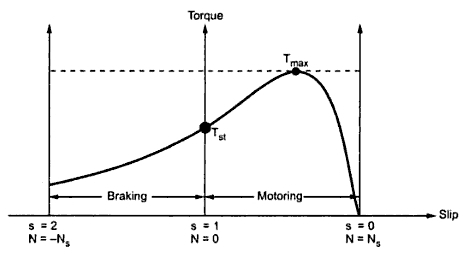 The torque-slip characteristics for motoring and generating action are shown in the above figure.